This little man, got himself out of bed early to do some knitting before school, this is very early as he leaves to catch the bus at 7.20am. Aahhh, but take a look at what he is knitting, this is Jakes first project on dpns, his last knitting project is still unfinished as he became a little disillusioned at the amount of counting he needed to achieve the look he wanted. He wanted the front of his jumper to be all cabled and it was really a little to much, when really all he wanted to do was pick it up and knit away, without thinking and counting! He is enjoying knitting Fetching, he says he likes knitting on small needles AND he wants to know if this means he can knit socks! Absolutely it does, I think we might need some more sock yarn for christmas…..
You’ll have to bring him over next time and he can join the men’s knit club at I Knit London! Another new yarn shop for you to visit! Will we get to see you this visit? I’ll be at Liberty’s on Thursday night, have Friday afternoon off work for xmas shopping and my first weekend at home for months! 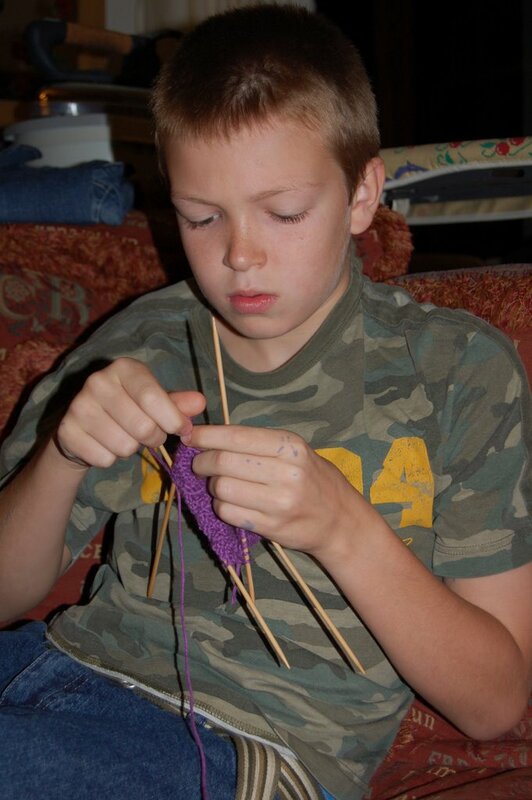 Oh wow, that is so impressive, first that he is knitting and second that he is using dpns! What a star. I meant to comment yesterday but I was busy…I hope your dog didn’t get poked by too many pins! And I think it’s great that your son is learning to use four needles. The world needs way more male knitters. Way to go Jake!